Officer who battled fire now fighting for her life: Haifa Police District Chief Superintendent Ahuva Tomer is in critical condition, after being hurt while escorting a Prison Service bus en route to a northern jail located near the site of Thursday's major fire. At least 40 Prison Service cadets riding on the bus were killed in the fire. Two polic officers have been declared missing. Tomer was initially taken to Mount Carmel Hospital, but due to her severe condition she was transferred to Rambam Hospital in Haifa. Tomer was riding in a police car along, with other police officers, right behind the bus making its way to Damon Prison. The Mount Carmel Hospital director said earlier: "Four injured individuals arrived here. Tomer, who was close to the burning bus, is currently in critical condition. We've tried to resuscitate her many times but we didn't lose hope." Tomer made history in the past after becoming the first woman to be appointed chief superintendent of a major police station in Israel, the Haifa station. Some 500police officers have served under her in the past year and a half. March 2009, when she was appointed the police station's commander, was the second time Tomer set a historical precedent. In 1997 she was the first women ever appointed commander of the police station in the northern town of Nahariya. Her service was cut short after a complaint was filed against her, but after a six-year legal battle she was acquitted of all charges and returned to the police as chief superintendent of the Haifa station. Before her latest post, she served as an operations officer in the northern district. Tomer was considered a cherished and professional officer. One of her friends on the force has previously said that "she does great service to women in the police by not flaunting the fact that she is a woman at every opportunity. She just does her job well." Adi Sardas contributed to the story. 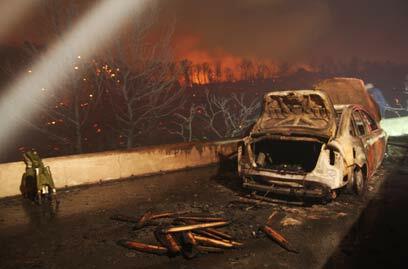 See all talkbacks "Northern blaze: Haifa police chief in critical condition"